It's funny how inspiration strikes! I wasn't feeling too well yesterday so gave myself permission to sit down with a nice cup of tea and watch a TV programme that I had recorded. It turned out to be a really bad show but I kept thinking "It has to improve!" It didn't but about fifteen minutes in, a female character appeared in a totally inappropriate but gorgeous black and cream dress! My brain started to whir into action and before I knew it, I was in my craft room! The first thing I did was to stamp three of the larger Paisley images onto Very Vanilla cardstock with Basic Black Archival ink. I then used a Smoky Slate Stampin' Write Marker to colour them. 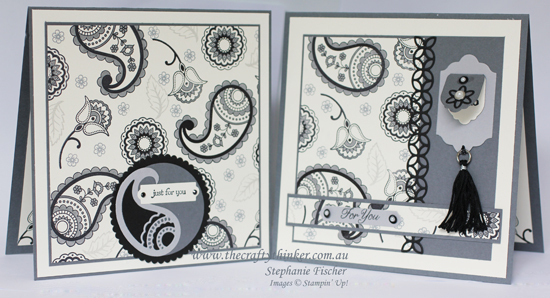 I then stamped the leaf image with Smoky Slate ink and the small flower with Basic Gray. I cut a 12" x 12" piece of Basic Gray cardstock in half to create two 6" square cards. This was the first card I made. I kept it fairly simple so that the stamped card remained the star of the show. To create neutral embellishments, I used the old trick of colouring Rhinestone Jewels with a black Sharpie. I've been hanging out to use one of these gorgeous tassles! Not wanting to waste any of my hand-made decorative paper, I made a second card. The lace is from the Flourish Thinlits and the little "pocket" is from the Cheerful Tags Framelits. I cut it once in Basic Gray and once in Very Vanilla. I cut the cream one in half and glued it to the inside of the tag. To attach the tassle, I punched a little hole in the bottom of the label, thread a needle with Black Metallic thread, positioned the tassle and sewed around the ring of the tassle and through the hole in the label. 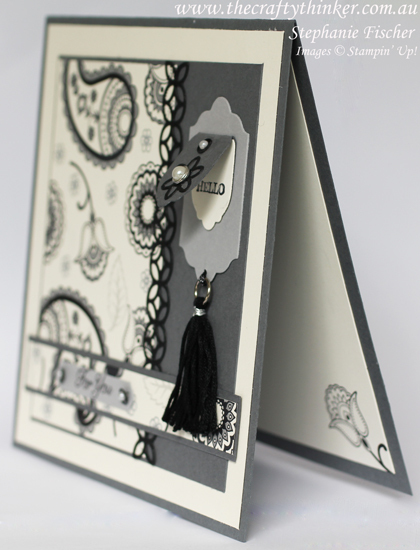 The "hello" greeting inside the pocket is from the Fabulous Flora hostess stamp set. 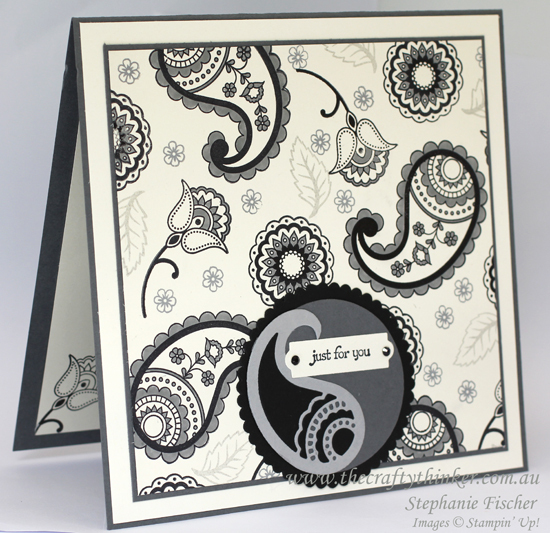 The "For You" greeting is from another gorgeous hostess set called Gift of Love. Opinion is divided in my household. My husband likes the original card the best whilst my son and I feel that the remnant card outshone the original.